Genealogy has become one of the United States’ most interesting hobbies. One can go into practically any library and fine a section on the cemeteries of your area, family histories, and regional histories. Even in your area, either in the McComb library of the Liberty library a person can find hundreds of books on the families and history of the surrounding areas. And not only that, but a historical and genealogical society probably meets once a month for those who want to further their knowledge of the region. 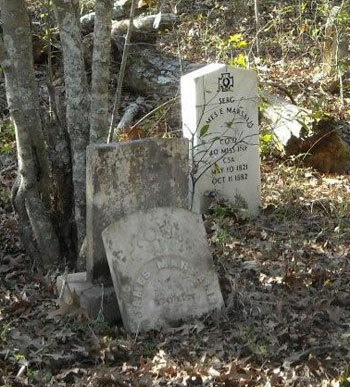 The descendants on one Mississippi pioneer couple are in the process of restoring their ancestor’s cemetery which dates from 1846. This couple, Peter H. Marsalis and Mary Magdaline Gordon Marsalis settled in Smithdale area in 1816, one year before Mississippi statehood. Their cemetery is hidden in a grove of trees on the original Marsalis property. It is heavily grown over with many headstones either broken, buried in forest debris, or stolen. It known that at least 20 burial sites exist. As stated earlier, descendants of this couple hope to restore the cemetery by clearing the grounds and fencing the property. State officials from Jackson have visited the cemetery and it is hoped that it will certified. If it is certified, it will allow Amite County to assist in maintaining the cemetery and possibly be designated as an Historical Site. The cemetery will be registered on the property deed in the Amite County courthouse so that future generations will have knowledge of its location. Upon completion of the cemetery project, a dedication ceremony will be announced. 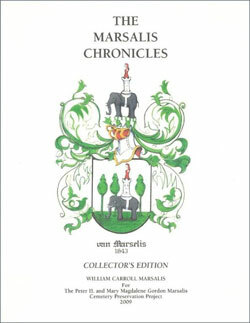 Several family members have started a fund for the restoration and will be selling a well documented history of the family from 1661-1846 era with 30 pages of family genealogy. All proceeds will be used for restoration. The cost of the book will be $25.00 . They can be ordered by letter to William E. Marsalis, 2290 Caples Rd., West Monroe, LA, 71292 or e-mail us by clicking here. Any descendant who might have information or photographs to share, wish to correct information in the publication, or wish to be placed on the Marsalis Family e-mail lists for updates can contact Thomas Wixon, 3010 Washington Ave., Pascagoula, MS 39567, (228) 762-0008 or click here to contact us.